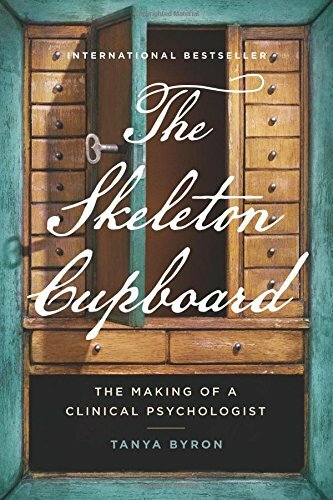 In The Skeleton Cupboard, author Tanya Byron chronicles her often distressing and occasionally uplifting journey to become a clinical psychologist in London. As a neophyte, she quickly learns that her university education barely scratched the surface of the real world of mental illness that she would encounter during her training placements. The course of becoming a clinical psychologist in Great Britain (similar to that in the U.S.), is structured so that half the week is spent attending lectures that address various modes of treatment and writing papers about those treatment orientations. Additionally, time is allotted to take exams and write a dissertation. The other half of the week is dedicated to a series of six placements that coupled with supervision allows the trainee to apply coursework and the various applications that work most successfully with actual patients. This system might be viewed as more comprehensive than in many states in the U.S. where students can choose the type of placement based on the modality most closely related to the one they prefer to focus on in their practice. The British training is more similar to internships and residencies for medical students in the U.S. that involve exposure to all types of illnesses. The most critical issue for trainees in the London program was the fact that the university lectures were concurrent with the actual treatment of patients. Thus one might be learning very rudimentary knowledge that was not sufficient to actually treat troubled patients. The patients Byron encountered were extremely diverse. There were some known as an “RDP” (revolving door patients) who were temporarily stabilized on medication but inevitably return due to a lack of community support systems. In addition to the frightening moments during her placements, there were monumental successes with patients as well. The hospital staff provided both care and dignity to the residents. Poignantly stated, “Within our white characterless bubble, we provided a haven, a tranquility and warmth.” At various intervals, patients had difficulty leaving this safe environment. Byron does not mince words when it comes to expressing her feelings of discomfort or even anger toward certain patients. After witnessing the aftermath of a young anorexic girl’s attempt to hang herself, and during the efforts to subdue the child, Byron alternatively felt the need to hold and comfort the child while also desiring to lash out at the patient. During this process the girl bit and kicked to regain her freedom. This is but one example of Byron’s exasperation with patient behavior during her various modalities of learning. At times her reactions might appear startling and/or disturbing for some readers as well as other clinicians. Though other clinicians may inwardly experience some of the same feelings, it is quite rare that they are expressed so openly (often harshly) and in such a gritty fashion. Thus, It is quite apparent that this memoir is distinct from other books written by other mental health professionals. In The Skeleton Cupboard the desire is genuine to educate others and stress the necessity to get past labels of stigmatizing diagnosis. One cannot doubt the critical nature of this premise; however, Byron’s no holds barred approach that includes dark countertransference reactions (albeit it human) toward difficult patients may lessen the appeal to a wide audience. Laura Schultz is a freelance writer and has been a licensed Marriage and Family Therapist for over 25 years. She has published articles on eating disorders, depression, and attaining joy, as well as health related topics such as allergies and vegan living.